So much to do, so little time. A trip to the San Francisco Bay area isn’t just a vacation, it’s an adventure. From cable cars to the Golden Gate Bridge, the City by the Bay is like a giant playground for the young and old. Do everything you can, and then plan on coming back to catch all the things you didn’t have time for. Trust me, you’ll have a list. I highly recommend buying a CityPass. The pass essentially guarantees you admission to many of San Francisco’s most sought after attractions. It also includes a 7-day passport good on the city’s world famous cable cars and Muni public transportation system. But best of all, it’s a huge bargain: $64 for adults, $39 for kids 5-12. Buy your CityPass directly from Alcatraz Cruises, so you’ll be able to include Alcatraz Island as one of your pass options. Tours to “The Rock” sell out quickly, so be ready to book yours when you purchase your pass. The ticket includes the ferry to Alcatraz, a self-guided audio tour (my 7-year-old did fine with it), and ferry back to Pier 33. Plan on a good three hours to do it right. The maximum-security prison held the bad guys no one else could. Gangster Al “Scarface” Capone and convicted murderer “Birdman” Robert Stroud were two of the island’s best-known residents. But Alcatraz is more than just a famous federal prison. Once a military fort, the island was home to the first lighthouse on the West Coast and is now a sanctuary for seabirds. Angel Island State Park is another favorite San Francisco tourist attraction with kids if you want more time on the bay. Once back on the solid ground jump on a street car (covered by your CityPass) and head for Pier 39. Skip the souvenirs shops and head straight to the real entertainment – the sea lions. 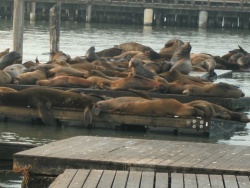 The boisterious group moved into the docks off the Pier in 1989, shortly after the Loma Prieta earthquake. Volunteers from The Marine Mammal Center are on hand most weekends to answer any questions you might have. I don’t know how they fit so much into one building. The California Academy of Sciences in Golden Gate Park has more than 40,000 animals, a four-story rainforest, planetarium, and natural history museum. The hardest part is deciding what to do first. My kids are partial to the roof. It’s alive! The Living Roof’s 1.7 million plants were specially selected because they could thrive in the Park’s unique climate. The green roof keeps the Academy's interior an average of 10 degrees cooler than a regular roof, and you can’t beat the view! With so much to see and do, it’s hard to remember to squeeze in some down time. There are a number of playgrounds scattered throughout Golden Gate Park, but the Koret Children’s Quarter and Carousel takes the cake. Opened in 1888, it’s believed to be the oldest playground in the nation. 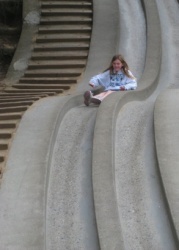 Grab a piece of cardboard (you’ll find plenty of it lying around) and race down the old style concrete slide. Climb to the top of the spider web and make some noise. Note all of these activities are not limited to kids. When you need to rest, go for a ride on the fully restored carousel. Last time I was there with my youngest daughter, the attendant taught her all about carousels and how they work. She got the complete lowdown – how to start it, how to stop it, and where to find the emergency brake. Golden Gate Park is bordered by the Sunset District neighborhood to the south and the Richmond District neighborhood to the north. Both are residential neighborhoods that tourists rarely stumble upon. But the lucky few who wander in are rewarded with some of the best casual and kid-friendly dining in the city. Some of my family’s favorites: Vietnamese at PPQ, grilled cheese and curly fries at Pluto’s, and sushi at Ebisu. Not sure what you’re craving? Stroll down Irving Street. There’s something for even the pickiest eater! One of the first things I did when I moved to the City by the Bay was to walk across the Golden Gate Bridge. Take layers, as the weather can change in an instant and vary greatly from one end to the other. The Golden Gate is 1.7 miles long, so wear comfy shoes and be ready for a walk. If you’ve got little ones, a stroller is a must. I can’t tell you how many of my friends, San Francisco natives, have never made the trip. Sometimes, being a tourist has its benefits. If you are here over the summer months and want more structured activities, check out the wide array wide array of Bay Area Summer Camps for kids of all ages. Visit CiaoBambino.com for more favorite San Francisco attractions with kids and for reviews of San Francisco family-friendly hotels.